McGee: Bishop have you not noticed how extra quiet Gibbs has been, lately? Tony: See, he's on about this. I don't agree with you. McGee: Jeanne Benoit? Really? Wow. Bishop: All I got out of Tony was "good friends" but I know there's more. McGee: Oh, there's more, believe me. There's so much more I don't even know where to start. Permalink: Oh, there's more, believe me. There's so much more I don't even know where to start. Taft: Whoa whoa whoa. South Sudan? That's rugged country for anybody, much less a guy six months out of major surgery. Gibbs: Funny, I don't recall asking. Taft: Send me a postcard. Permalink: Send me a postcard. Abby: You forget about South Sudan, mister. You're not going anywhere. Abby: Don't Abby me. You collapsed in the squad room, Gibbs. What part of that is okay with you? Gibbs: Were you there? I did not collapse. Bishop: Yeah, you kind of did, Gibbs. Gibbs: Aw swell. Where's DiNozzo? Where's McGee? Let's bring the whole gang in here. Permalink: Aw swell. 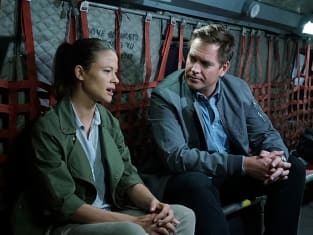 Where's DiNozzo? Where's McGee? Let's bring the whole gang in here. Tony (flashback): I'm sorry you got caught in the middle of all this. Benoit: Was any of it real? Benoit: I wish I'd never met you. Permalink: I wish I'd never met you. Palmer: I'd be happy to research African tribal traditions for you, Agent Bishop. Bishop: That'd be great, Jimmy. Thanks. But for me? Ducky: Eleanor has it not occurred to you that you are now running point? Permalink: Eleanor has it not occurred to you that you are now running point? Gibbs: The only therapy I need is my job. Taft: Be sure to put that on your tombstone. Permalink: Be sure to put that on your tombstone. Gibbs: I'll talk. I don't need my head examined. Taft: Oh, no. Perish the thought. In which case, that leaves.....me? Permalink: Oh, no. Perish the thought. In which case, that leaves.....me?